“As a joke my wife said: ‘Why don’t you put a V8 in it?’” Con says. 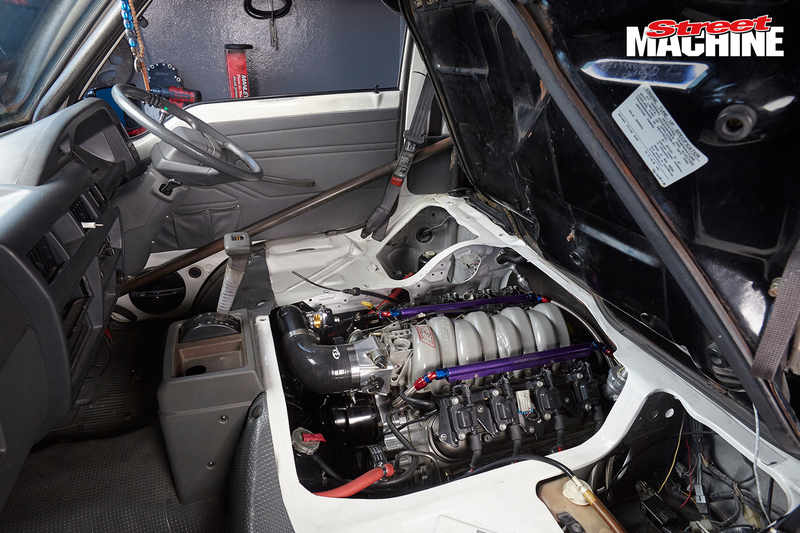 “That got me thinking, so I asked my mate Elvio Gonzalez what he thought and he said: ‘It’ll be cheaper to put a V8 in it than rebuild the two-litre.’” They bought a VH Commodore to strip out the five-litre engine and trans, then got Peter Cleary to fit it all into the van. 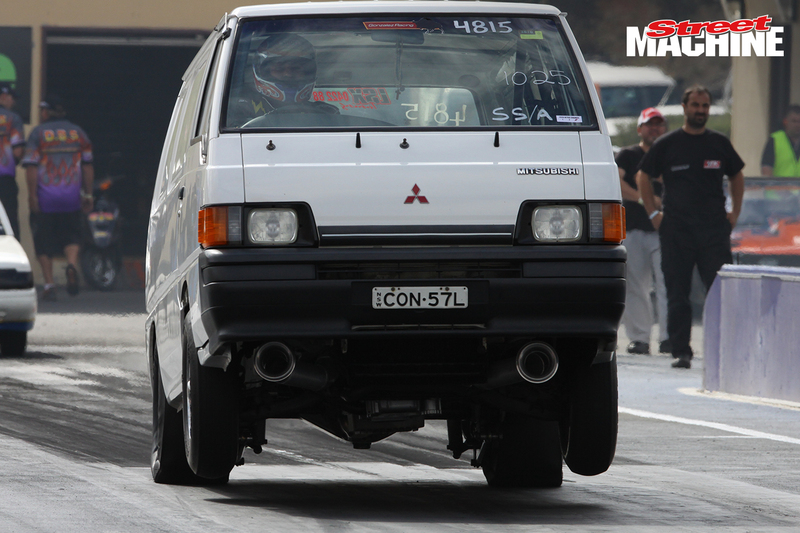 Throw in a nine-inch diff from Craft Differentials and all of a sudden the guys had the quickest plumber’s van in Sydney. Over time the carby 308 was swapped out for an EFI VN-headed five-litre tuned by Injection Perfection, and with a 125hp nitrous shot the L300 was blasting its way to low 11-second quarters – the best run was 11.2@122mph. As quick as that was, Con didn’t take too long to get used to the power and started looking around for the next upgrade. Elvio suggested they put an LS engine into the van, so the little bus went back to Peter Cleary’s for the heavy engineering. Elvio built a stout engine combo using a cast-iron truck block and filling it with all the good gear from Eagle, SRP, AFR and FAST. 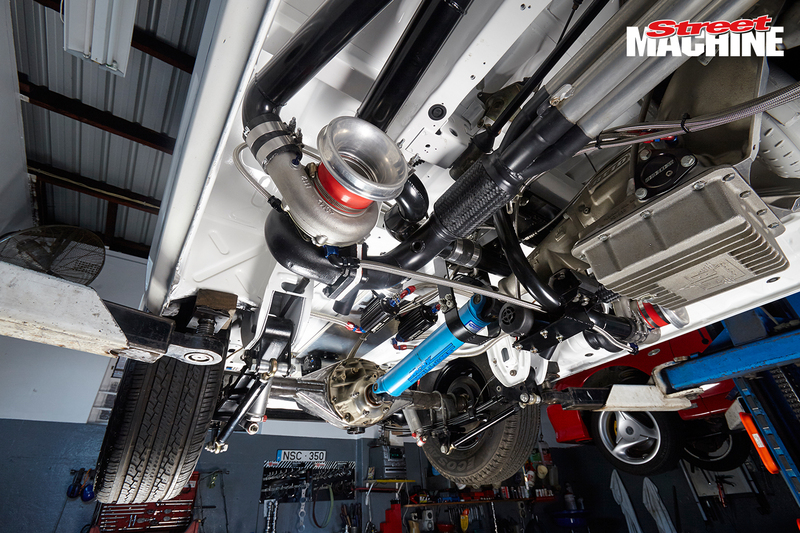 On the dyno the engine made 625hp, tuned by Gokhan at LSX Tuning – it’s no slouch. Back at the track the van went 10.10@131mph, but Con still wasn’t satisfied. “I was going to put nitrous on it,” he says, “but Elvio suggested we go with two turbos. ‘Twins are more fun,’ he said.” This kicked off a fresh three-year build that would see the Mitsubishi getting a major upgrade; it headed back to Peter Cleary’s again, then off to NSC Racing, where Con and his mates Dennis and Gerry pulled it down, and now they’re in the process of putting it all back together. The whole thing has been resprayed with a fresh coat of white and there’s a full ’cage to suit its eight-second potential. Twin 62mm turbos have been mounted to the chassis underneath; one either side of the Powerglide’s output shaft. The turbos are just cheap Chinese units, and their low position under the van dictates the use of a Tilton differential cooler pump to drain the oil away. With the turbos positioned away from the engine bay, there’s no real need for an intercooler. 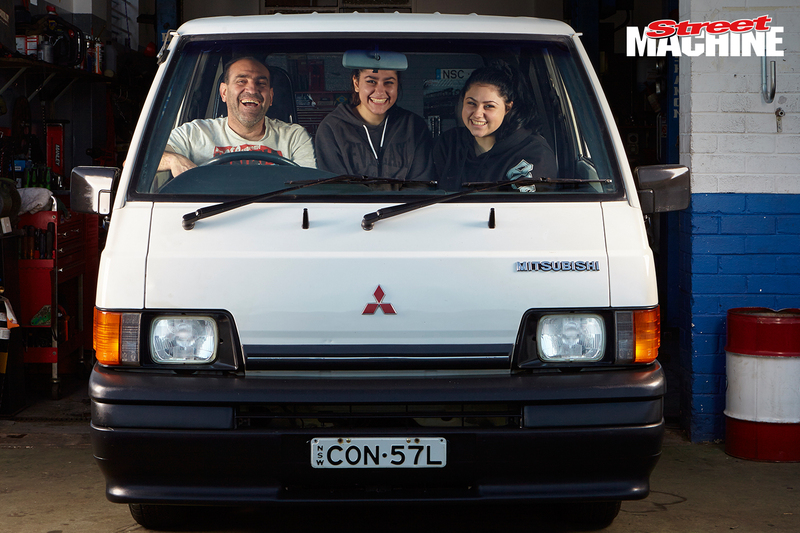 The guys reckon the van has the capability to get into the eights, but they’re not quite sure how hard they want to push the wild little machine. After all, its short wheelbase and tall height means it’s not the most stable of race cars. Whatever it runs, it’s sure to be a wild ride.